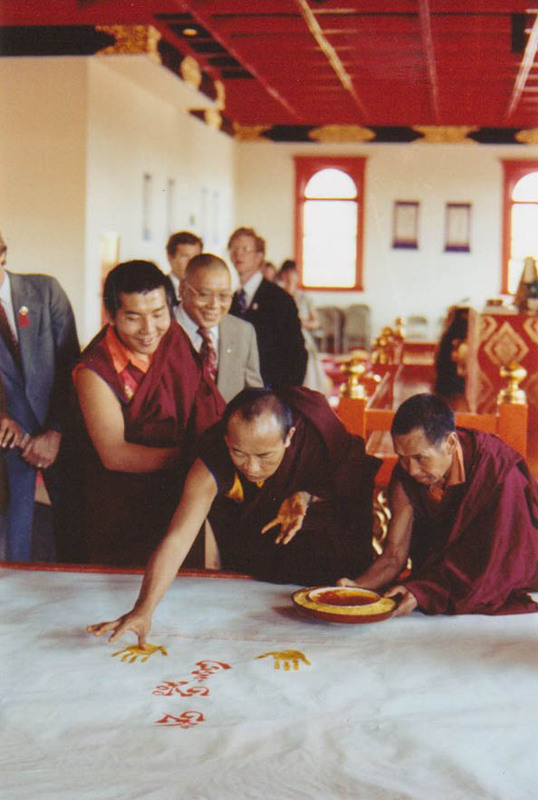 During his final visit to Boulder in 1980, His Holiness the 16th Karmapa empowered the Vajradhara thangka for the main shrine of Dorje Dzong (now known as the Boulder Shambhala Center) with his golden handprints. 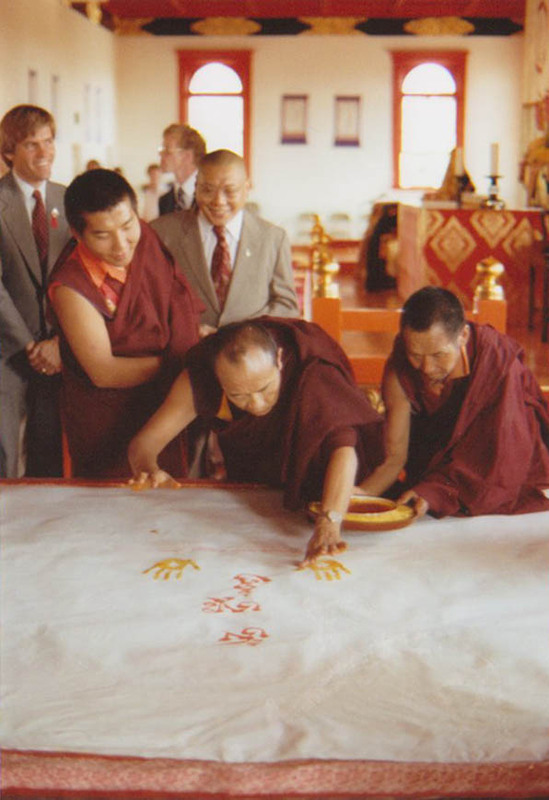 In this article from 2008, Clarke Warren talks about the significance of this thangka and of the Karmapa's handprint empowerment. Update: As shrines around the Shambhala International mandala changed their central iconography from Vajradhara to the Primordial Rigden in the late 2000s, this one prominent shrine remained unchanged. 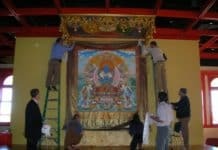 In December 2010, after much debate and speculation this sacred thangka was removed. It now hangs in the Great Stupa of Dharmakaya at Shambhala Mountain Center. 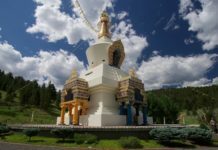 For more information please see this article by Lindy King: Installation of the Vajradhara thangka in The Great Stupa of Dharmakaya. Sometime in the late 1970s, Chögyam Trungpa Rinpoche commissioned his close friend, the renowned Tibetan artist Sherab Palden Beru, to paint a Vajradhara thangka for the main shrine of Dorje Dzong, now known as the Boulder Shambhala Center. Sherab traveled to Boulder and began work on the thangka, and over a period of many months, a magnificent representation of Vajradhara was rendered, empowered and installed above the main Dorje Dzong shrine. 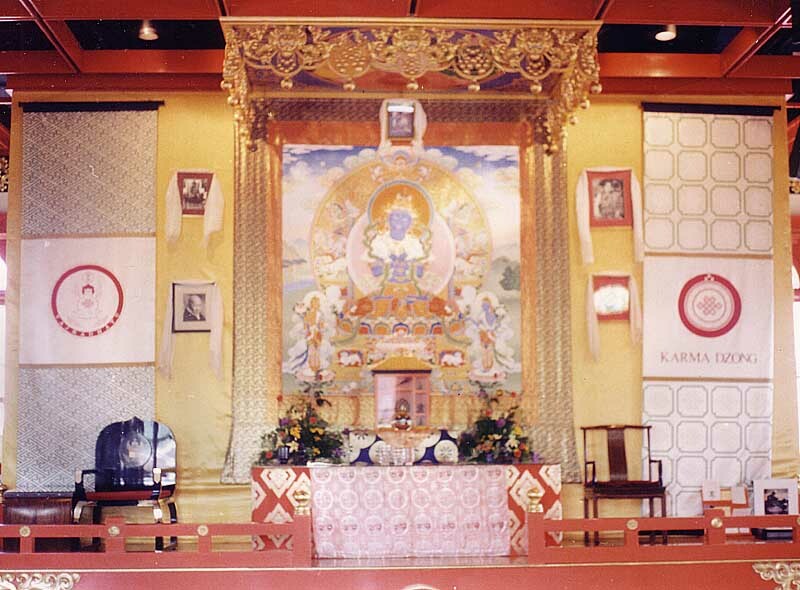 Created by Trungpa Rinpoche’s aspiration, command, and consecration, the thangka also bears the indelible great seal of the 16th Karmapa, in the form of his actual handprint in gold leaf on the back of the thangka. Over the years it has been further empowered by many great teachers, through innumerable empowerments and teachings, and through decades of practice under its watchful gaze. Not only is the thangka a powerful and predominant presence in the shrine room, but it embodies a great deal of the history and legacy of Trungpa Rinpoche’s transmission of buddhadharma in the West. In Vajrayana teachings and culture, sacred images are regarded as nirmanakaya manifestations of enlightened buddha nature, and play a central role in the embodiment and transmission of wisdom and realization. They often surpass by far their minimal definition as “representations.” Sacred images properly executed and blessed have their own powerful authentic presence, their own precise and efficacious skillful means, and their own bodhisattva activity. In general, the greater the empowerment or blessing, the greater the presence and power of the image. Some are said to actually talk and move about. Some have remarked that they are indeed excellent likenesses of themselves. Some contain and dispense terma, or treasure teachings. Many are terma. 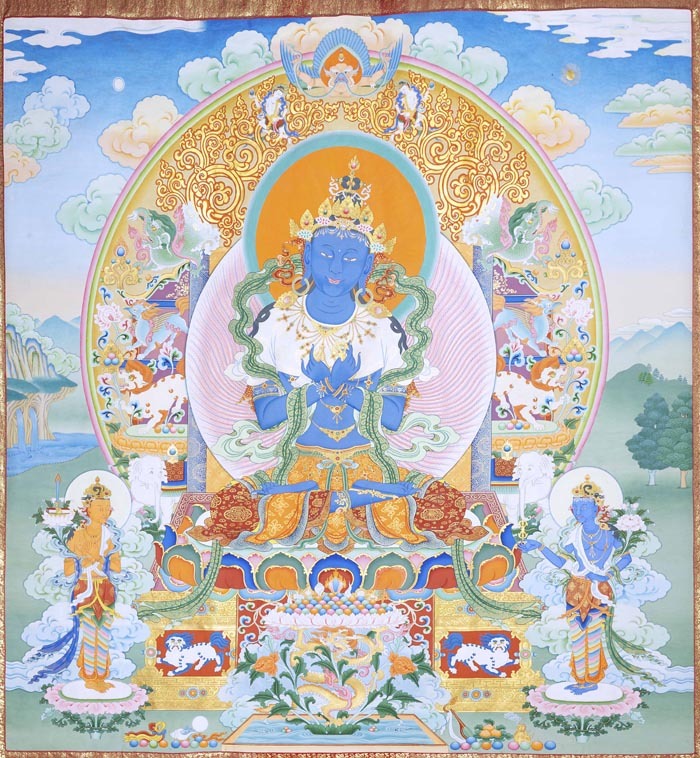 In one way or another, empowered thangkas and rupas are regarded as embodiments of the energies they represent. In the monasteries and temples of buddhist Asia, sacred images have been an integral part of carrying on traditions, inspiring practitioners, protecting the dharma, and embodying as well as transmitting lineage blessings. Such images are created with great and precise mastery, blessed by enlightened masters, further empowered by practice and devotion, and are the source of endless inspiration, encouragement, and awakening. 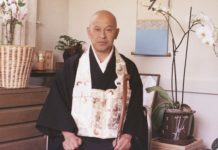 Sacred representations of enlightenment that have endured through generations of practitioners are considered to be as powerful as enduring lineages and enduring tulku lines. They contribute to the enduring transmission of dharma and they magnetize teachers, practitioners, and blessings. The rupa of Shakyamuni Buddha, known as Jowo Rinpoche in Lhasa’s Jokhang Temple, is the most sacred image in Tibet, and is a prime destination of pilgrimage for all Tibetans. 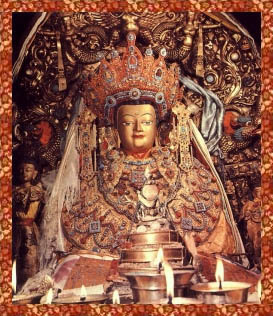 The image was brought to Tibet by Weng Chen, the buddhist Chinese princess married to King Songtsen Gampo and was a key factor in the implantation of buddhadharma in Tibet. It was strategically placed to both subdue obstacles and to ensure that dharma would flourish in the Land of Snow. The thangka of Vajradhara in the Dorje Dzong shrine room in Boulder, Colorado is of this class and significance, and is particularly important for the transmission of dharma in the West. It is itself a transmission of dharma and lineage, and from the sacred outlook view of the mantrayana, it is Vajradhara, the primordial Buddha. 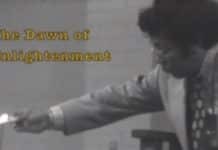 It is also the living embodiment of Trungpa Rinpoche’s enlightened intention to bring dharma to the West, and it conveys the power of the many seminal events which have transpired in its presence. During a talk in the Boulder shrine room in the last year, the Dzogchen Ponlop Rinpoche lauded the thangka and recalled the occasion, at which he was present, when the 16th Karmapa sealed the back of the thangka with his golden handprint. 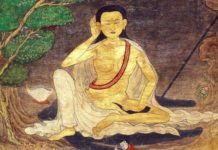 If the Vajradhara of Dorje Dzong is the living embodiment of the primordial Buddha, it has watched and listened as nearly all of the great lineage teachers of our time have entered its presence and proclaimed the dharma. The list includes the Dalai Lama, the 16th Karmapa, Dilgo Khyentse, Sakya Trizin, Ugyen Tulku Rinpoche, Jamgon Kongtrul, Tai Situ, Khenchen Thrangu, Jigme Phuntsok, Dzogchen Ponlop, Dzongsar Khyentse, Gantey, Jetsun Khandro, Tsultrim Gyatso, Kusum Lingpa, Chokyi Nyima, Sakyong Mipham, Chögyam Trungpa himself, and many others. And now, the Vajradhara thangka will host the first visit to Dorje Dzong of the 17th Karmapa, His Holiness Ugyen Thinley Dorje, whose mind is inseparable from Vajradhara, demonstrating the continuity of the Karmapa’s blessings from life to life. The Vajradhara thangka has also seen the introduction of Shambhala vision and the unfolding of Shambhala Training. 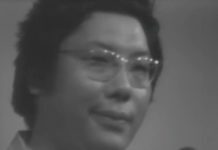 Many of Trungpa Rinpoche’s early Shambhala teachings were expounded in its presence, and many of the early Shambhala Training levels were presented under its gaze. It was also present when Dilgo Khyentse Rinpoche empowered Trungpa Rinpoche as the Druk Sakyong, and when Trungpa Rinpoche empowered his son as the Sawang, the heir to the Shambhala lineage. It was in the presence of this thangka that the Vidyadhara bestowed the first full vajrayana empowerments in the West. The Vajradhara of Dorje Dzong has heard the cries of newborns who are now teachers, leaders and practitioners, and watched us bid farewell to many dear vajra brothers and sisters. One member of the Boulder sangha recently commented that as he moved around the shrine room at the Boulder Shambhala Center, the eyes of Vajradhara seemed to follow him wherever he went. The eyes of Vajradhara have indeed watched and witnessed the presentation, implementation and evolution of dharma in the West over many years. May Vajradhara continue to guide and inspire us. May the powerful presence of the Great Vajradhara of Dorje Dzong guide and inspire future generations. Many thanks to Clarke Warren for writing this and bringing out so many important points about this image of the dharmakaya buddha, Vajradhara—its presence, its history, its purpose and function. I was fortunate to live in Boulder when this thangka was being painted by Sherab Palden Beru. I remember going on a “field-trip” with a Buddhist Studies class from Naropa Institute, to the home of Jim and Margaret Drescher, where the thangka and the painters and painting process took up most of their living room. 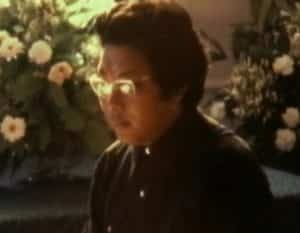 I recall that Lama Ugyen Shenpen was living there, and I believe that David Brown and Gregg Smith were Sherab Palden Beru’s painting assistants. Margaret told me that the Vidyadhara Trungpa Rinpoche would sometimes come over during the course of the painting to see how things were progressing and offer gold, which was then incorporated and used in the painting of the thangka. I was also fortunate to be in the shrine room on the day that His Holiness blessed the thangka. 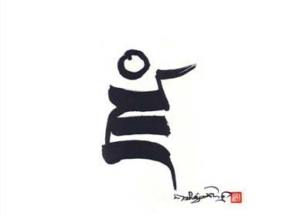 The Vidyadhara had already calligraphed OM AH HUM on the back of the thangka to bless the body, speech and mind (head, throat, and heart) centers of Vajradhara. I remember that His Holiness dipped his hands into very golden-yellow saffron water, (it might have had gold-leaf in it as well), and then placed his hands very definitely and firmly on either side of the HUM, thus leaving his hand prints. Then he very carefully used his thumbs to paint-in the blank spaces left from the hollows of his palms. The lower photo shows him first filling in his left hand-print and the upper photo shows him filling in his right hand-print. Then he signed his name between them, with his famous “Mary” signature (looks like “Mary” in English). As you can see from the photos, His Holiness and the Vidyadhara and everyone were very happy! There was a joyous and uplifted feeling of having this thangka blessed so thoroughly. Please grant the coemergent siddhis. This was inscribed six times in the following scripts (and languages): Lentsa (Sanskrit), Uchen (Sanskrit), Uchen (Tibetan), Roman (Sanskrit), Roman (Tibetan), Roman (English), so it is a veritable time capsule of the dharma, expressed over many times, lands, and languages. You can see a clear reproduction of all this on page 94 of John Stevens’ wonderful book, _The Sacred Calligraphy of the East._ Shambhala Publications, 1988.